IV (Intravenous) Sedation. Intravenous Conscious Sedation (aka “IV sedation”) is when a drug, usually of the anti-anxiety variety, is administered into the blood system during dental treatment. 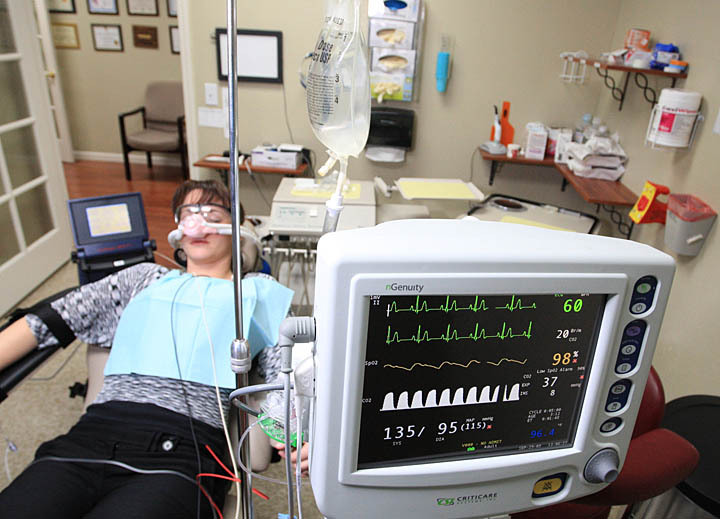 During sedation, you will be closely and continuously monitored by the dentist and staff members, using electronic equipment that shows blood pressure, heart rate, the amount of oxygen in the blood and, often, your heart function on an EKG monitor. After the procedure is over, you will not be released until it is safe for you to go home. You and the person taking you home will receive post-treatment and home care instructions including what you should eat and drink. Safety is paramount for providers of IV sedation. All dentists who offer it must complete programs that meet or exceed the guidelines established by the American Dental Association in 2007. These include extensive training courses in sedation of patients under expert supervision until proficiency, competency and experience are achieved. Be accompanied to and from the appointment. Not eat or drink after midnight the day before. If you need to take prescription medication, speak to both your physician and dentist. Wear loose, comfortable clothing to the appointment. Don’t wear contact lenses, oral appliances (dentures, retainers, etc. ), or watches/jewelry.